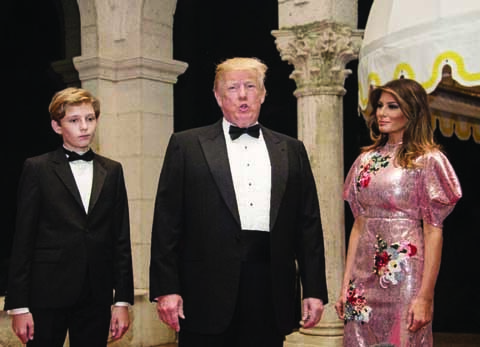 US President Donald Trump-pictured here at a New Year\'s party at his Florida resort, flanked by son Barron and wife Melania-kicked off 2018 with a tweet sharply critical of Pakistan on Monday. The tweet brought a quick and pointed rejoinder from Pakistan, which said it had done much for the United States, helping it to "decimate" Al-Qaeda, while getting only "invective & mistrust" in return. US-Pakistani ties, long contentious, have taken a nosedive under Trump, who in August declared that "Pakistan often gives safe haven to agents of chaos, violence and terror." "The United States has foolishly given Pakistan more than 33 billion dollars in aid over the last 15 years, and they have given us nothing but lies & deceit, thinking of our leaders as fools," Trump said in an early-morning tweet. Last week, The New York Times reported that the Trump administration was weighing whether to withhold $255 million in already delayed aid to Islamabad over its failure to crack down more effectively on terror groups in Pakistan. Last month, Trump had already hinted that he could cut off the aid. "We make massive payments every year to Pakistan. They have to help," he said in unveiling his national security strategy. The comments were an extension of repeated US warnings that Pakistan must stop offering cross-border havens to Taliban factions operating in Afghanistan as well as armed jihadist groups fighting US troops and their Afghan allies. Pakistani Foreign Minister Khawaja Muhammad Asif responded angrily to Trump's tweet, telling Geo television in an Urdu-language interview: "The United States should hold its own people accountable for its failures in Afghanistan." He said all funds from the US had been "properly audited" and that "services (were) rendered." And Defense Minister Khurram Dastgir Khan tweeted that Pakistan "as anti-terror ally has given free to US: land & air communication, military bases & intel cooperation that decimated Al-Qaeda over last 16yrs, but they have given us nothing but invective & mistrust." Lisa Curtis, who is the director for South and Central Asia on Trump's National Security Council, wrote in an article last year that the "activities and operations of diverse terror groups on and from Pakistani soil, and the government's failure to rein them in, threaten vital US national security interests in the region." She added that "Pakistani authorities-specifically the country's military leaders, who control its foreign and security policies-need to take a comprehensive approach to shutting down all Islamist militant groups that operate from Pakistani territory, not just those that attack the Pakistani state." Trump first signaled that the US was reassessing its fractious relations with Pakistan in August, when he accused Islamabad of harboring "agents of chaos." After the September 11, 2001 terror attacks in the United States, Washington forged a strategic alliance with Islamabad to help in its fight against extremists.